Everyone loves seafood, from the health benefits to the flavor, and seafood is one of my favorite things to cook. You can imagine my excitement when the fine folks at SizzleFish.com reached out to me to try their product. SizzleFish sources premium quality seafood and ships individual portions directly to your home. Stocking up and cooking with the fruits of the sea couldn’t be any easier. Now sit back, grab your favorite glass of Chardonnay, and enjoy this post for Sizzlefish Asian Glazed Sockeye Salmon. The fish coming from SizzleFish is flash frozen and portioned to single serving size. The contents are in a recyclable container with dry ice to keep the contents frozen during shipping. Inside the box they include small cedar planks perfectly sized for the individual pieces of fish. Sockeye Salmon is caught in the Alaskan waters and is notable for its bright red color. High in omega-3, this fish is one of the healthiest to eat. I made a simple Asian glaze using brown sugar, soy sauce, garlic, ginger, lime, and hoisin. I let the glaze slowly reduced as the salmon cooked on top of the cedar planks. The Big Green Egg was preheated to 350° and the cedar planks (soaked for 2 hours) were placed on top of the cooking surface. I placed the sockeye salmon skin side down on the cedar planks and cooked for 20 minutes. Just before the salmon was cooked through, I brushed on the Asian glaze giving the salmon a beautiful color and delicious flavor. I’m already looking forward to my next meal choosing from the fine selection of seafood from SizzleFish! 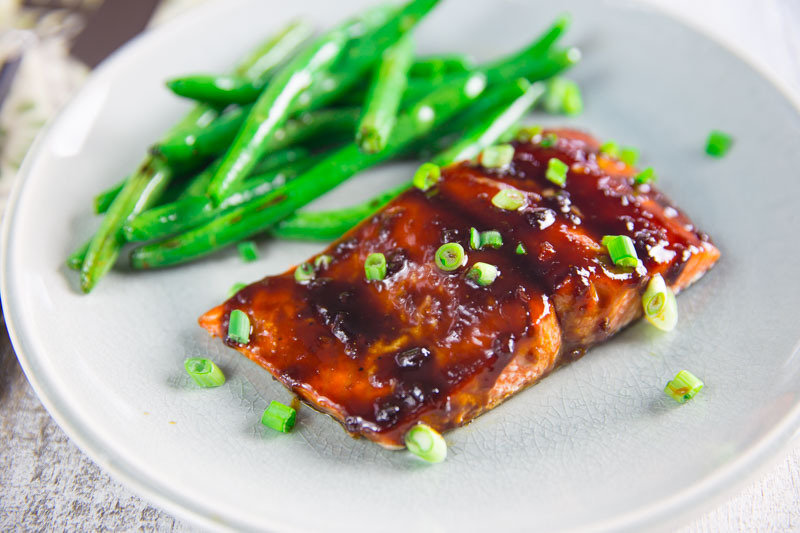 This recipe for SizzleFish Asian Glazed Sockeye Salmon is delicious and healthy. The flavors of the Asian glaze marry beautifully with the sockeye salmon to create the perfect meal. Saw this and faved it because I knew i wanted to try it. Finally made it on Sunday. This was incredible! Yet another delicious recipe, my friend.